Hello! This weeks theme is a very important one. We are bringing awareness to cervical cancer. As a woman who has had to deal with cervical issues, it's very important to me to share this information. A few years ago I had an abnormal test result. I was terrified. My doctor decided to watch the issue very carefully for the next few months. Things were not progressing as he would like so he performed a biopsy and then more monitoring. After that, he decided it was time we do something. I had a procedure to remove the abnormal cells. When the biopsy results came back, the cells showed to be headed in the direction of Cervical Cancer. He explained to me that there were levels of tissue of the abnormal cells. My abnormal cells were one level away from being considered cancer. If I had not gone to the doctor, or chosen to ignore the abnormal results, things would be very different for me. I am so grateful to my doctor. I encourage every woman to go to your annual visit every year. I have been free and clear ever since. 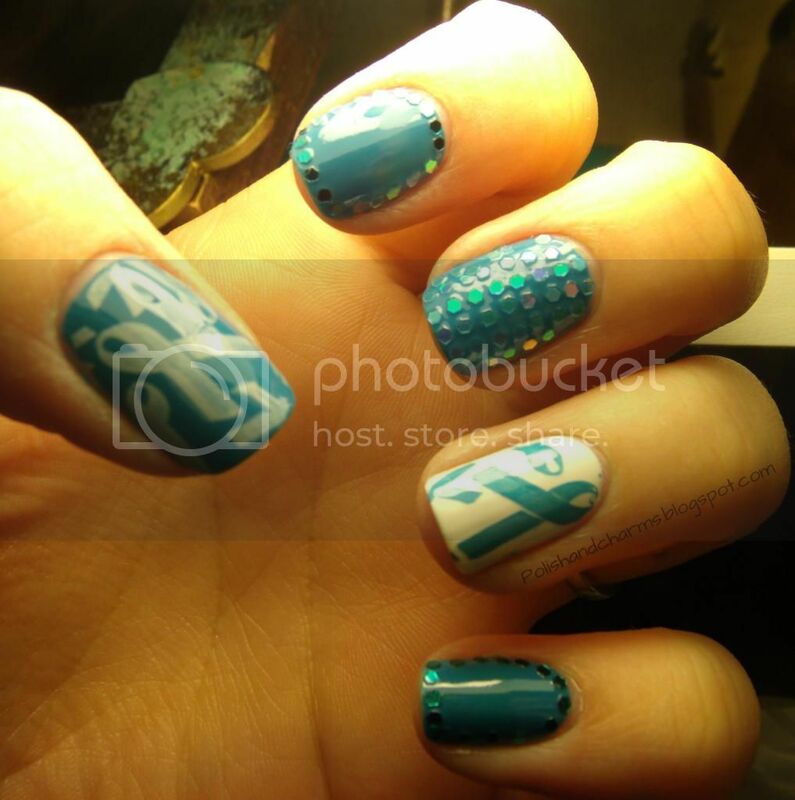 So here is my manicure to show my support for Cervical Cancer Awareness! I used a basic white on my ring finger and Sinful Colors Why Not on the rest. I stamped using bundle monster plate 321 and then added some glitter as accents on each nail. Here is some more information about Cervical Cancer. As the month of January brings cervical cancer into focus, it’s time to increase public understanding of the disease, including its prevalence, approaches to screening and prevention, treatment options, and resources that offer updated cervical cancer information throughout the year. Each year in the United States, more than 11,000 women are diagnosed with cervical cancer and approximately 4,000 die of the disease. While certain types of the human papillomavirus (HPV) are linked to cervical cancer, vaccines such as Gardasil® and Cervarix™ are designed to prevent infection with high-risk types of HPV and have the potential to greatly reduce the occurrence of cervical cancer. For more information on cervical cancer, its treatment, and support, please visit Cancer Connect by clicking here. Don't forget to check out what the other ladies have to share today! I'm so glad that your doctor caught things when he did Meredith! Thank you for sharing your story and thanks for this inspiring manicure- I love it! Those studs are fabulous! On a side note, I'm so glad you decided to share your story. I can not imagine how terrifying your situation was. I'm so glad you're happy and healthy and we love ya girl! This is really nice Meredith!! Such a fun manicure! i love how your middle finger came out, so cool! I am so glad that you are okay!!! This is an amazing mani! Thank you for sharing your story - I am so glad to hear that you're healthy! Well done!! I love the glitter placement you did! These are pretty! Gorgeous mani for a good cause. Thank you Brandi! I love you guys too! Me too! Thank you Maribeth! Thank you Katherine! Me too! Wow Mere! You did a really awesome job here! I'm way too lazy for glitter placement but it is such a cool look. Lovely! I searched all my plates for an image like this, but I didn't have this one! Oh wow, this is pretty fantastic! Beautiful mani Meredith! I'm glad you followed up and have been in the clear ever since. I'm sure it was scary either way. Nobody wants abnormal test results for anything!